Native of South America. 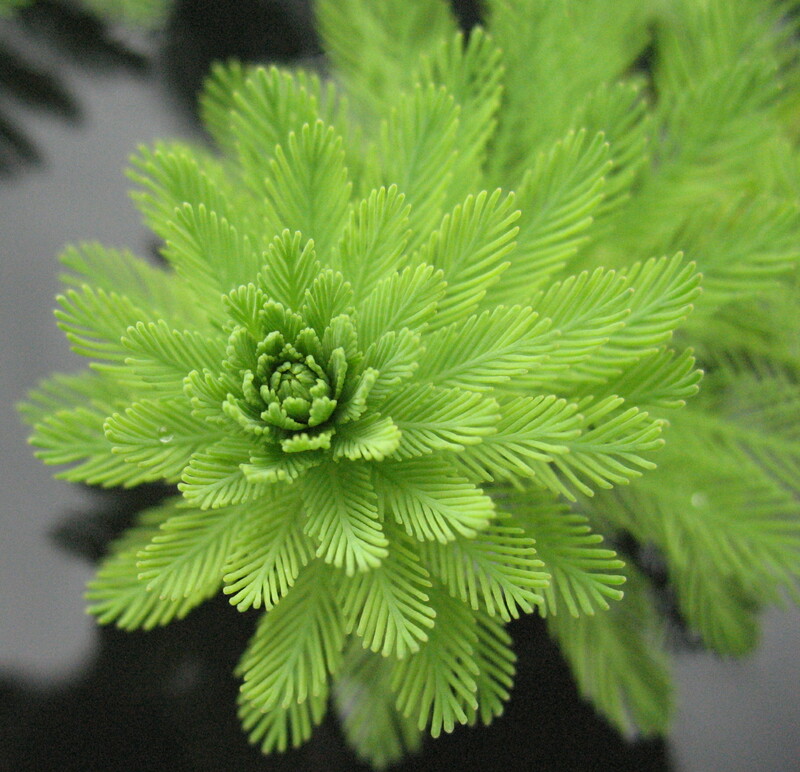 Myriophyllum aquaticum is now widespread around the world. Description: Myriophyllum aquaticum is a perennial aquatic herb. Stems spreading and erect, hairless, to 5m long and to 5mm wide, rooting at lower nodes. Leaves hairless with blade of submerged leaves to 4cm long, emergent leaves 2.5–3.5cm long, 0.5–0.8cm wide, crowded towards tip. Distinguished by all leaves in whorls; blue-green emergent leaves, toothed in whorls of 4–6; leaves with 18–36 teeth, lack of fruit (in Australia). Myriophyllum aquaticum lushly textured foliage helps provide shade for the pond and fish. It also provides a hiding place and spawning material for the pond inhabitants. Because of its capability of establishing itself in wet soil above the water, Myriophyllum aquaticum can be used in waterfall crevices, as well as along pond edges. Although it may be prone to frost damage, it winters well beneath the ice in frozen ponds. Flowers: Male and female flowers produced on separate plants. Only female plants found in Australia. Flowers have 4 triangular white sepals, 0.4–0.5 mm long; petals absent. Propagation: Spread by stem fragments as seed is not produced in Australia. Notes: Forms dense stands that impede flow, especially in nutrientenriched water. If male plants are introduced the species may become more of a problem.